(CNN) -- Debt problems and lack of credit. A housing crisis and a funding shortfall. These are not the problems of the Western world in the face of the global economic downturn, but some of the lingering challenges in Myanmar one year after devastating Cyclone Nargis hit the country, aid groups said. 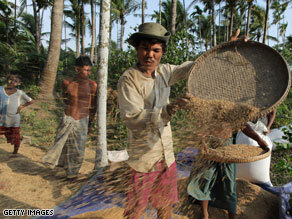 Farmers sift grain during the rice harvest on April 27 in the Irrawady delta village of Ma Lot Myit Than. The cyclone, which hit Myanmar's Irrawaddy Delta on May 2 and 3 last year, killed 140,000 people, severely affected 2.4 million people and left 800,000 displaced, aid agencies said. "Cyclone Nargis caused a level of destruction similar to the worst-hit areas of the 2004 Indian Ocean tsunami," said Claire Light, Oxfam's country director in Myanmar. "The 2.4 million people affected will continue to feel its impact unless aid keeps flowing for the next three years." The storm also flooded farmland, caused the widespread deaths of farm animals, destroyed farming and fishing equipment, and damaged fish and shrimp ponds. Farmers in the delta, a water-streaked piece of land that juts into the Bay of Bengal, follow a seasonal cycle of borrowing and repayment as they plant and harvest their crops. When the cyclone struck, it immediately reduced the availability of affordable credit, Oxfam said. "One of the many impacts of Cyclone Nargis was that it destroyed almost an entire harvest that farmers and fishermen had already borrowed against before the cyclone hit," said Light. Before planting, farmers borrow money, animals and tools from mid-scale farmers who are a common source of credit in the delta region, Oxfam said. The expected returns of the two harvests -- one in the dry season and one in the wet season -- allow them to pay back their debts, creating a predictable financial cycle. Because the cyclone hit in the first few days in May, it affected farmers in the final stages of their dry season harvest, Oxfam said. It meant the storm destroyed or damaged much of the harvest, leaving small-scale farmers unable to fully repay the loans they had taken out for the dry crops. That, in turn, made it difficult for those farmers to get credit to finance their 2008 wet-season crop, Oxfam said. Storm damage also meant mid-scale farmers -- the ones who do the lending -- had limited money and equipment to lend to these small-scale farmers. "There is less opportunity for people to earn money," Light told CNN. Fishermen, too, have been unable to repay their loans in full because they lost fishing boats, nets, tools and even areas where they can fish. They are now experiencing high levels of unemployment, Oxfam said. Nargis wiped out health centers and schools in addition to causing widespread destruction for farmers, fishermen and other laborers, aid groups say. High levels of debt are creating the risk of chronic poverty for cyclone survivors, Oxfam said. In the short term, debt means families must focus on putting food on the table instead of purchasing shelter materials and other essentials needed to rebuild their livelihoods, aid groups said. Some 130,000 people are still living in temporary shelters, said Chris Kaye, the World Food Program director in Myanmar. Light, of Oxfam, said half a million people are living in what the group considers "inadequate" shelter. "Whilst the international community did an outstanding job in providing temporary emergency shelter in the form of tarpaulins and plastic sheeting and so on and so forth, it's that permanent shelter which is so important, and which we're struggling (with) now," Kaye told CNN. The World Food Program had hoped to phase out food assistance by now, Kaye said, but instead it is still providing food for about 350,000 people. Shelter, debt and making it through the next season were the main concerns Kaye said he heard from villagers when he last visited the region a few weeks ago. "The fact that so many people have such high levels of debt because they've tried to rebuild their lives from nothing has meant that one of the things that's going to be sacrificed, potentially, is the purchase of needed inputs for the upcoming farming season," he said. "Farmers are not in a position to be able to pay for the seeds and the fertilizer to put in the ground in many parts of the southern areas of the delta." Aid groups said they were worried that international attention to the ongoing recovery in Myanmar was diminishing. "The challenge facing the survivors of Cyclone Nargis now is that aid flow and attention has waned in the recovery phase," said Ramesh Shrestha, the UNICEF representative in Myanmar. "Unless the most crucial needs in reviving livelihoods are addressed, communities will need to continue relying on humanitarian support and sustaining the gains of the past year will be difficult." The international aid appeal issued immediately after the cyclone is only two-thirds funded, aid groups said. Oxfam called for urgent international assistance before June so that farming and fishing families can kick-start their upcoming harvests and repay their loans. A recovery plan prepared by ASEAN, the Association of South East Asian Nations; the United Nations and the government of Myanmar, said $690 million was needed over the next three years to restore people's lives to how they were before the cyclone, according to Oxfam.